My name is Moe Aljaff and by definition, I am a schmuck. 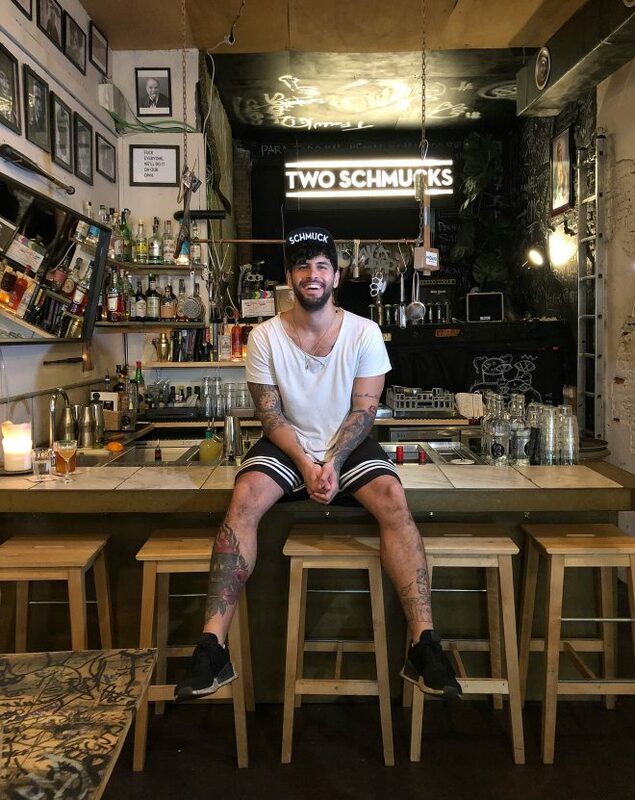 I’ve worked in the bar industry for the last 9 years, from Norway to Amsterdam, India, Thailand and now Spain. I lied to get my first job behind a bar when I was 19 years old and said I had five years experience when I had none and of course after 10 minutes the boss knew I was lying, but he kept me. It was in a hotel so they let me work the night shift from midnight to 7 am. Each time someone was sick, I would jump behind the bar, so slowly I learnt the job. After working together in Oslo at places like Himkok, AJ and I moved to Barcelona to maybe open a bar, but there was nothing definite. We knew Barcelona had the perfect mix of a big city With a beach vibe and it had a lot of potentials. I was part of the global final for Bacardi Legacy in 2016 so we thought it would be a good idea to ride the wave. We asked Bacardi to sponsor us to organise Two Schmucks pop-ups around the world. It was not only about cocktails but more about the ambience, music and vibes. We went to Paris, Greece, Cyprus and Amsterdam and we were asked to continue in Copenhagen, Beirut and Taiwan… At this time we didn’t even have a bar, but we said we did so we had no choice but to open one. We looked for a space for 4 months in 2017, but when we found one the bank let us down. It was an old taco joint in the Raval district which had been ordered to close down by the authorities and the owner wanted to sell fast. Watching videos of my Bacardi Legacy experience, the owner surprisingly agreed that we could pay a small amount upfront, before making monthly repayments. So after six months, we had a bar, but no money at all and that’s why everything here has been built by us. As we began to be successful, with regulars and articles, it’s allowed us to start the kitchen. Two Schmucks is a contradiction, I am one way and AJ the other, so Two Schmucks is the middle and it makes it better. What I realised in this job, is what I like is progress. You tick your boxes one by one, it’s great. So that’s what we have with this bar. The only thing we’d change would be the size of this place, so we could put a large rectangular communal table in the middle, with the bartender on one side and people sit all around it. Then our role would be to connect our customers with each other, so the conversations would go all around the table. During the day it could be a space for people to work with their computers while they eat our great food made by our brilliant chef from New York. And in the evenings it would be our bar. I tend to work. I do try to force myself to switch off, but it’s difficult. I love white rum, like Clarain Sajous or other agricol rums. Maybe it’s because of the environment here because it’s hot, so I enjoy using that kind of rum. And usually rum is easy to use, but I believe it’s less true with agricol rums as they are quite punchy. A good cocktail is when you drink the first one and you want a second one straight away. It should also match with the context because it depends on your state of mind or the moment of the day. In the end, it’s all about great flavours. I love sherry. There are so many here in Spain and they are all so different. My favourite right now is amontillado sherry, because of its nuttiness. In Barcelona go to Carlos and Matilda, it’s our go-to bar here, as they change the menu weekly and the cocktails are great. We also like Marlowe and my favourite international bar right now is Le Syndicat in Paris.